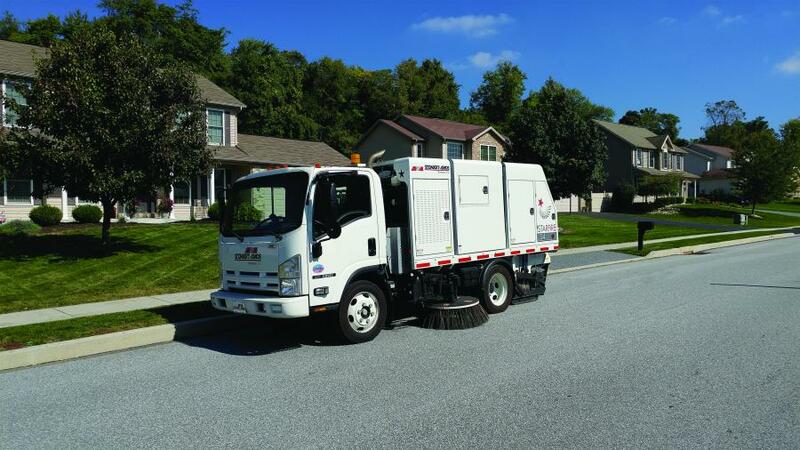 Stewart-Amos Sweeper Co., leading designer and manufacturer of the most productive and cost-effective street sweepers available, introduces the Starfire S-4c, a heavy duty, mid-size mechanical broom street sweeper mounted on a highly maneuverable 19,500 GVWR non-CDL chassis. The Starfire S-4c is an update of Stewart-Amos' extremely popular Starfire S-4 with many value-added features that enhance the S-4's time-proven design. Key enhancements include a 10% increase in hopper dump heights (up to 11′), tighter 16′ 9′′ turning radius, 20% larger fuel tank (up to 36 gallons), 2,000-lb. greater hopper lift capacity, and road- or curb-side (left or right side) hopper dump. The S-4c is unique in that it is the only mechanical broom sweeper on the market that allows customers to specify either street- or curbside hopper dumping. Customers simply choose a dumping side that best meets their visibility, safety, and productivity needs at the time of purchase. The Starfire S-4c comes with standard Starfire features such as: an exclusive 3-shaft elevator system that significantly improves wear life over similar 2-shaft designs, spring-balanced, full-floating gutter brooms that automatically compensate for wear, and extra reach 44” dump door that makes debris disposal faster, cleaner, and safer. This unit also has a large 4.0 yd3 debris hopper mounted on massive quad (4) “X” style lift scissors for improved lifting strength, stability and dumping capability. Stewart-Amos will exhibit an S-4c during this year's National Pavement Expo, Feb. 1-4 in Nashville, TN (booth 953), and APWA Public Works Expo, Aug. 27-29 in Orlando, FL (booth 200). Attendees are encouraged to stop by. For more information, visit www.stewart-amos.com.